All of us at Nomadic Expeditions have realized a common dream . . . to explore the unspoiled and less traveled areas, and to visit and learn from the diverse and wondrous cultures of the world. As a group of experienced adventurers, we are dedicated to acting as a knowledgeable friend and guide to each traveler we assist, in the hopes of enabling each of our clients to achieve a dream of their own. Nomadic Expeditions was founded after Mongolia's peaceful revolution in 1990, when Jalsa Urubshurow, a Mongolian American, made his first visit to his ancestral homeland. 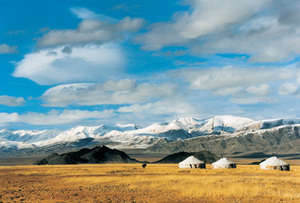 During the visit, the Prime Minister recruited Jalsa to expand Mongolia's accessibility to western travelers. Jalsa has been an instrumental force in promoting Mongolia. In 1990 he was authorized by the Mongolian government to found the U.S.-Mongolia Business Council, a Washington-based nonprofit organization dedicated to aiding bilateral economic and trade relations. He continues his efforts to promote Mongolia and remains an active board member of the U.S.-Mongolia Business Council. Is Nomadic Expeditions your company? Register to get access.